How do you blow off steam at the end of a busy workday? When you make your money by the gig, time literally becomes money. That can lead freelancers to work as much as possible. But a 24/7 work life isn’t healthy. Freelancers need hobbies too. These benefits are especially appealing to freelancers. Since we are constantly out their selling ourselves, and our services, we need some activity to help fill us back up. Hobbies can also make you more appealing to future clients. A unique hobby makes you interesting — a compelling person that others will want to work with. If all you do is what you do for work, you may find it hard to connect with your client base. Of course, we freelancers are also some of the busiest people we know. Because we’re always looking for the next gig, we can feel like there is never time for anything else. Kurtz knows the busyness of life all too well. But she doesn’t let the excuse “I’m too busy” keep her from her hobbies. In fact, having a hobby that you schedule can actually help you get more done. Kurtz explains that according to Parkinson’s law “work expands so as to fill the time available for its completion.” The more time you have, the longer your work will take to do. When you fill your calendar with events like “Write novel” or “Knitting Club” you trick yourself into being more productive in the time leading up to those events. That means adding hobbies to your calendar can actually seem to create more time to get your freelance work done. At the PatchWork Collective, we want our members to live full, healthy lives. That means we do more than give them a place to work. We’re interested in their hobbies too. We host monthly creativity groups, which allow our members and guests to schedule a date with their muse and connect with other creative types in a relaxed social environment. If you don’t have a hobby — or are looking for a new one — PatchWork has you covered for that too. We also offer monthly Creativity Workshops that give members and guests the chance to learn something new. The next workshop is this Thursday, November 15, 2018 at 5:30 p.m. 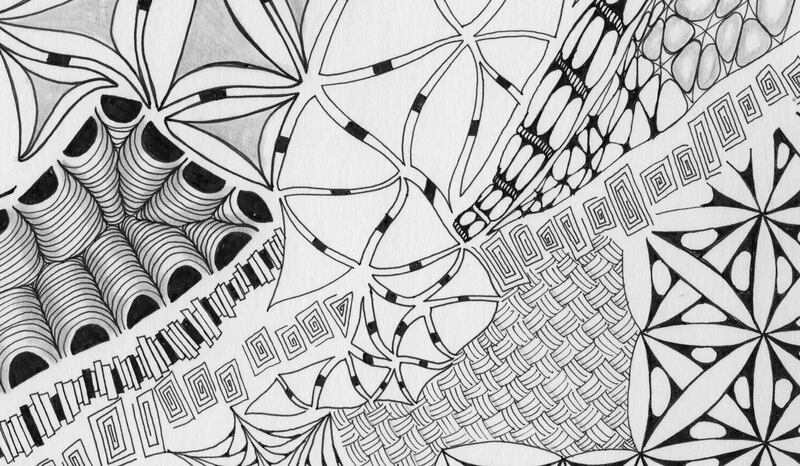 Founding Member Samm Wunderlich will be teaching members the meditative art of Zentangle. Come learn a strategy to set your mind at ease while making beautiful pictures. Want to suggest a new hobby for our creativity workshop? Need a place to spread out and do your craft? Contact the PatchWork Collective to find new ways to balance work and creativity.